Our unique Grid view presents daily events in color-coded cards annotated with express icons, which are integrated with bi-directional scrolling and quick zoom to another Day or Month grid. So you can stay on top of your schedules, zero in on the event you want in a snap, and act quickly with even more express icon to come. From a Month view, you can zoom to a Day list by tapping on a More tag. 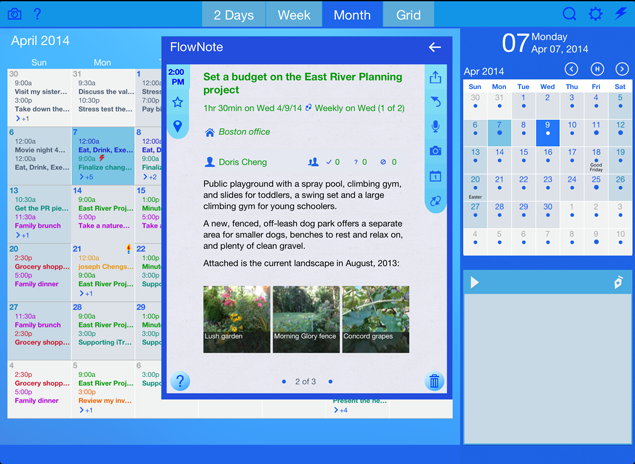 Then, browse, edit, and share the events in one continuous stream in FlowNote. Also, there are due-date and birthday reminders at a glance. Interestingly, the Month view can act as a navigator like the mini month, so you always know where you're by the blue highlight for the date you have selected. Support time zones set automatically or manually in the device Settings. Edit the events created in the current time zone, while browsing all calendar events. Create slideshow albums from a collection of photos curated by you, or from monthly camera roll. Zoom the mini month to another month or year via the respective express iconbars by tapping the Month or Year label. Reschedule the event you want directly with the express icon on the Grid or Priority view. Send the same invite to a new set of invitees by clearing the existing ones in one tap. Email to itrackfast(at)gmail(dot)com. We're always there for you. Follow us on Twitter for upcoming features and updates with the iTrackFast handle. Unlike adding an event with Plus icon in the Month and Grid views, you press and hold on a desired time slot in the 2 Days and Week views to open the Quick Add. To edit, briefly tap on an event, or a More tag to browse, edit, and share the overlapping events in one continuous stream. Managing the repeating events is easy - reschedule one or all remaining repeating events, or copy the series in the Date & Time popover, and change the repeat pattern, frequency, and total number of repeats in the Repeat popover. When tapping on the Trash icon, you can cancel one or all remaining repeating events. That's why the FlowNote is your workhorse. By paring the Week view with Priority popover, you can focus on today while keeping weekly activities in check. Browse, edit, and share events or tasks in one multimedia browser. 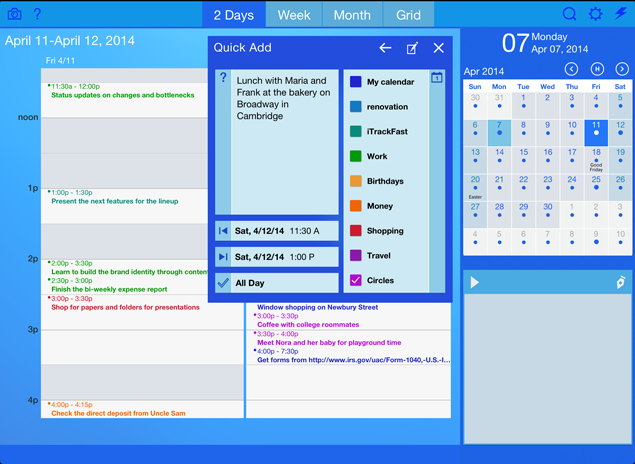 Add an all-day, same-day, or multi-day events with friendly date and time pickers. Tap a blank space to add a paragraph or link with smiley; tap an icon to add a location, priority status, repeat pattern, photo album, and voice memo, to share with groups, and to reply to organizers. Tap to edit existing text paragraphs or tap and hold to delete an object. Copy an event and a list of invitees by by rescheduling it. Cancel an individual event or the remaining recurring events. Browse slideshows, voice memos, Google maps, and Safari links. 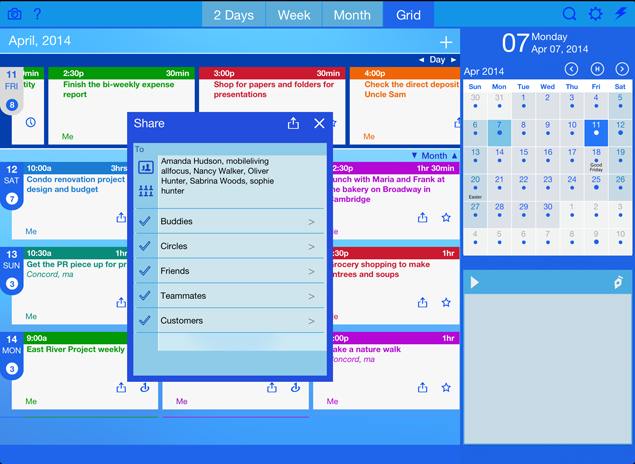 Manage the events through a Day or overlapping list in one continuous stream. Events are organized by calendars, priorities, repeat patterns, smileys, and keywords for fast search. Tell the contacts apart with their email addresses. Email via the secure Apple Mail server with dynamic mailing list, whether you pick your invitees from an imported list, a mini Contacts list, or groups defined in Settings. Access the Share icon from FlowNote or Slideshow, or open it directly from Grid or Priority view. Import the events from the device calendar to the respective calendars in the app, including those from existing services like iCloud, Exchange, or Google Calendar on your device without any passwords. Export events created in the app to the device calendar, which will get populated to other services through the device. Search by five classes of tags, then edit and share it in FlowNote. Make albums, play slideshows, and share photos in a snap. Scribble to surprise yourself and avoid the keyboard blues. Get a quick start with the on-the-go help and search. 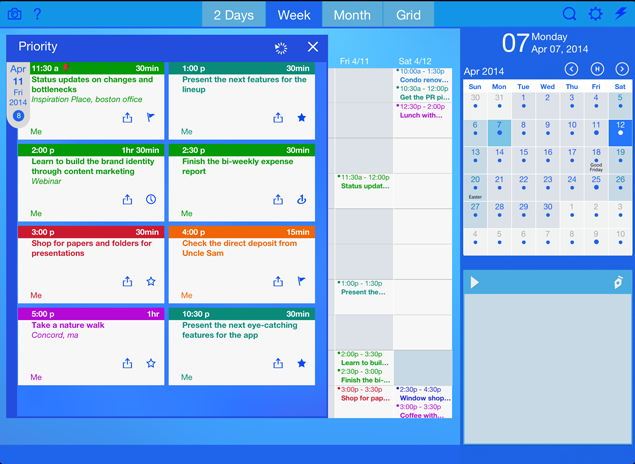 The events and tasks are all color coded to reflect the calendars they belong to for all calendar views. However, they appear in dark gray if the start times are already in the past, with the exception of Grid and Priority views. © 2010-2014, AllFocus, Inc. All Rights Reserved. iTrackFast is a trademark of AllFocus. All other logos and trademarks are properties of their respective owners.